Allium's amazing purple balls of color burst onto the scene in The Big Little Garden in spring of 2018. Dozens of 'Miami', 'Mars', 'Purple Sensation', 'Firmament', 'Flavum',and 'Graceful' bulbs had been planted in the fall of 2017, adding to an earlier experimentation with the varieties 'Christophii' and 'Sphaerocephalon'. Hours of planting effort and the long winter wait were well rewarded. Allium of different varieties bloomed from May until August, adding color, texture and interest. Visitors often ask, with a smile, "what are those big purple balls floating in the garden?" Allium bulbs are planted in the fall along with tulip and daffodil bulbs and are available in many colors, shapes and sizes. In my garden, purple is the dominant theme, with blooms ranging from golf ball to volleyball size! Lesser known varieties sport yellow, white, pink and even blue blooms. A major design feature is that allium can be planted very close to and in between perennials and other bulbs. Strappy foliage usually lays close to the ground and is quickly covered by the foliage of adjacent plants. This allows the foliage to die back naturally and undetected, hence fueling the bulb for next season's bloom. An added benefit is that once the color and flower petals fade, the "skeleton" remains as a beautiful dried orb for use indoors in a vase or to decorate a book shelf. Many of my clients have become "allium addicts" and we all plan to feed our addiction with more bulb planting this fall! Examples below reveal the magic that allium brought to my garden beds this year. While allium prefer full sun, I have had good results growing them in dappled shade. Seen here with Solomon's Seal, Goat's Beard and Heuchera. Note the minimal allium foliage which is already dying back while the bloom is just getting started! The fireworks begin early with Allium interplanted among Daylilies, Amsonia, Knapweed and Achillea. A later blooming variety 'Miami' is seen in bud in the foreground (lower left) and in the middle of the image above. Receives afternoon sun. After the Iris die back, this bed is dominated by yellow and orange tones. The allium provides a much needed "purple replacement" later in the season. This bed is dominated by iris and daylilies which are lovely but can be "heavy". The plan is to add more allium bulbs this fall to "lighten" things up for next year. Three different varieties of tall allium can be seen in this bed in various stages of bloom. 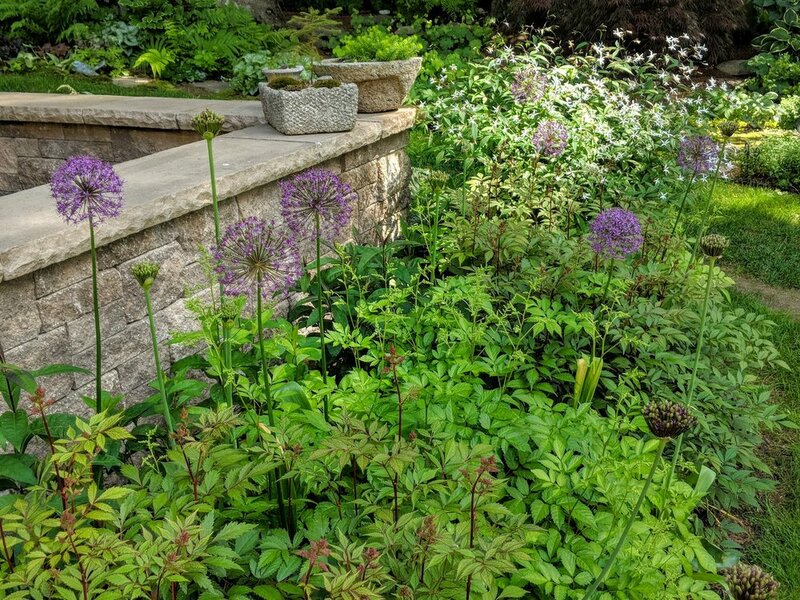 The allium on the far end of this garden bed serve as an effective focal point and lead the eye to the back garden with rhododendron and beyond. Allium can be a useful solution for awkward planting areas. Three different varieties with staggered bloom time are seen here curbside, emerging from low growing sedum underneath the mailbox. Dried seed heads will remain well after frost. Here, the allium provide a much needed pop of color now that tulips are dormant and have been engulfed and left to die back beneath the astilbe. 'Purple Sensation' blooms first, followed by 'Miami' shown here as buds are just beginning to open up. The allium flowers will persist through the bloom of the astilbe and beyond. Their balls peak above the stone wall and are greatly appreciated from within the patio's dining area. Note how most of the allium foliage is hidden under the dense (and more attractive) astilbe foliage. Click through the photos above to see closeups of allium blooms and their dried seed heads. Photos below show the small in stature Allium 'Millenium' and 'Summer Beauty' which are lovely grown in clumps and in containers. Feel free to reach out to me if you are in the Nashua/Hollis area and interested in buying allium bulbs (and other hard to find ephemerals) in bulk!